CONSERVATIVE religious forces and prevailing power structures (on both the Right and Left politically) are helping to keep people apart and stop women and others come together to affect progressive change in British society. 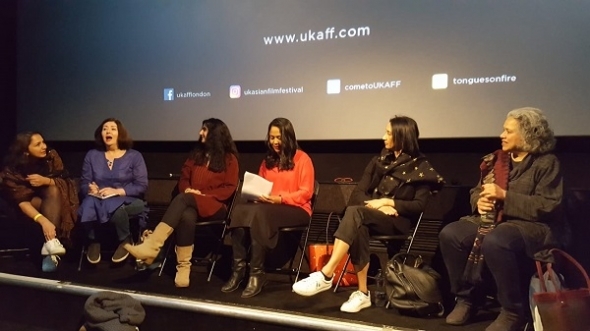 That was the sentiment espoused by a panel of high-powered women activists and commentators brought together by the UK Asian Film Festival and the campaigning and care organisation, Southall Black Sisters (SBS) last Saturday (April 6). The panel also discussed the role of two films screened that day in both reflecting and influencing wider changes in society. There was a feeling that too much respect was being shown by Government and other bodies to organisations of a religious character, whose agenda was often at odds with Equality – some said it was barely credible to deal with groups that side-lined or ignored women and dismissed gay people – as in the ongoing Birmingham Parkfield School row – and flouted both the spirit and letter of the 2010 Equality Act. SBS is celebrating its 40th anniversary this year and the UKAFF – which started out as a women-orientated festival designed to showcase the best of independent South Asian female film talent, was originally inaugurated as Tongues on Fire, 21 years ago – joined hands with SBS to organise two separate but consecutive Saturdays of screenings and post-film discussions. The first took place on March 30 and you can read about that here. Its debate, Struggle not Submission, featured Kiranjit Ahluwalia, whose seminal case was supported by SBS and became headline news. The organisation is widely credited with changing the law to help people in abusive relationships seek legal redress. The later debate saw ‘My Beautiful Laundrette’ (1985) and ‘Brick Lane’ (2006) being screened and a post screening talk, titled, Subversion & Dissent, being held afterwards at Rich Mix, Shoreditch in east London. Chairing the debate was Rushanara Ali, the Labour MP for the area. She told the audience that both films were chosen for a reason and had played a part in her own political consciousness. Saying what an honour it was to host the debate on behalf of SBS – and joking that it gave her a day off from Brexit, she added: “All of our lives have been enriched by the work that its founders and visionaries have achieved. “SBS has been inspirational to me – as they were to you. “These are very powerful films with themes relevant to our lives. “We started to feel that our stories were being represented on screen and in literature – and whether she (Monica Ali) liked it or not, she became a role model to women, like me of Asian origin. “There simply were not enough people of my background in these fields, and the contribution you have made is huge,” said Rushanara Ali of Monica Ali. 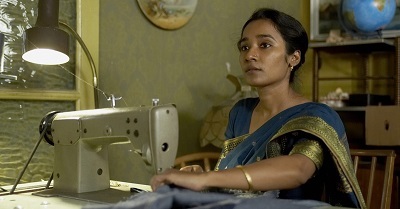 ‘Brick Lane’ featured an affair between a Bangladeshi-born woman and a young British Bangladeshi Briton, who later becomes more religious in outlook. The filming sparked controversy and even protests in Tower Hamlets – where it had been set to film before the location was changed. Monica Ali felt much of the criticism had been whipped up by the press at the time. “Reports made it sound as though there was a big upsurge against it (the film), that just wasn’t true. “There were only about 70 people – and most of them were journalists and there were only two women there which I found interesting, in and of itself. She said the press privileged “older male and conservative voices” over the young and women. “SBS supported me and I am very grateful for that,” said Monica Ali. Panellist Gita Sahgal, writer and filmmaker, was invited to a discussion about the script for the film. “They were academics and one said a Bangladeshi woman would not have an affair,” reported Sahgal. She countered this idea and said the film showed just how such a woman could have an affair. As the debate went on, many said not enough people were challenging conservative religious elements and both the Right and the Left were not doing so in case they upset potential voters in these communities. Sukhwant Dhaliwal, founding member of Feminist Dissent, felt a climate of separation and division was infecting discussion. “It seems impossible to empathise with anyone who is different to you. “ I am not only against White Supremacism; I am against all forms of Fascism,” she declared. Amina Lone used to be a Labour councillor in Manchester but left because she felt some colleagues put their religious sentiments before progressive ideas. She said it was outrageous to see protests in Birmingham against teaching about all kinds of relationships. She felt too many people were just blindly taking sides and not appreciating the issues. Monica Ali gave a stark example of religious sensibilities trumping and thwarting debate. “‘Brick Lane’ was supposed to have a Royal Performance with Prince Charles, but as a result of the so-called controversy it got cancelled – and that was damaging to the film. “There was also playwright Gurpreet Kaur Bhatti’s play ‘Behzti’ (‘Dishonour’ – it had to pulled from Birmingham Rep Theatre – following protests because the play is about a sexual assault in a Gurdwara). 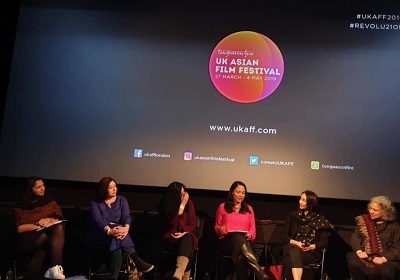 The UK Asian Film Festival London closed last Sunday (April 7). Read the wrap story. UKAFF runs in Manchester (Home) from April 30-May 4.